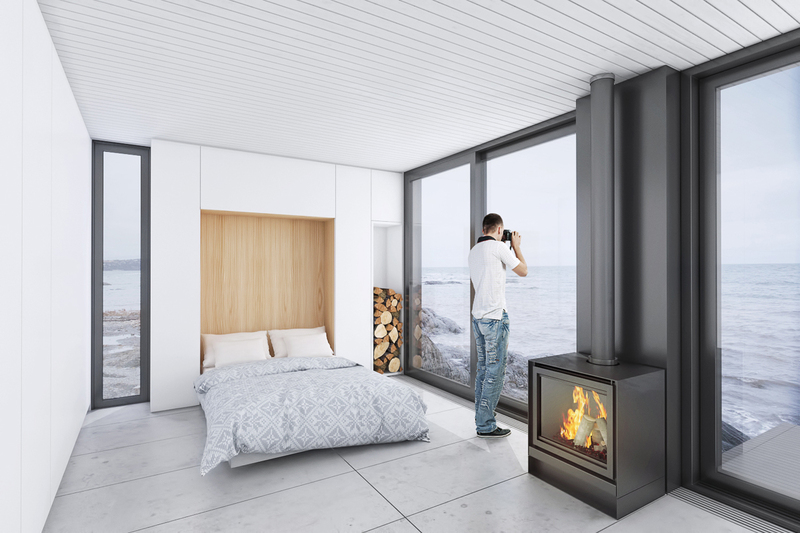 Developed in collaboration with Écohabitation and modular home manufacturer Énergéco, the REFUGE S400 was designed for people looking for a simple, contemplative and functional place for nature retreats. Thanks to a completely fenestrated facade, the shelter has the quality of being able to frame a landscape and to offer spaces bathed in natural light. The interior design of the shelter has been thought out so that the occupants do not feel cramped. 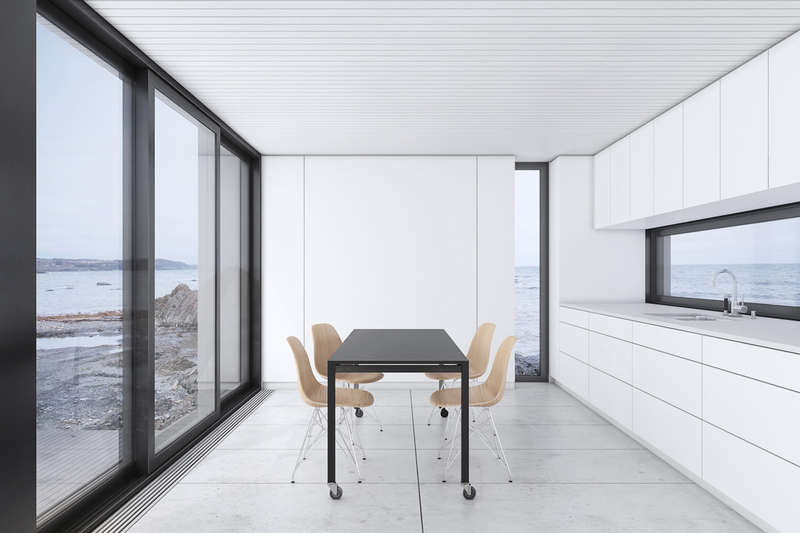 Kitchen, bathroom, retractable beds, storage cabinets and mechanical equipment have all been grouped together as integrated furniture to free up a large and flexible central space. In order to preserve the natural character of the implementation site and to limit its ecological footprint, the shelter is built in factory, then delivered on site and installed on piles. Thanks to its compact size, the shelter can be prefabricated at fixed costs under controlled conditions. It is then delivered on site and carefully positionned in relationship with the landscape. The types of finishes and equipment are customizable to meet the needs of the owners. 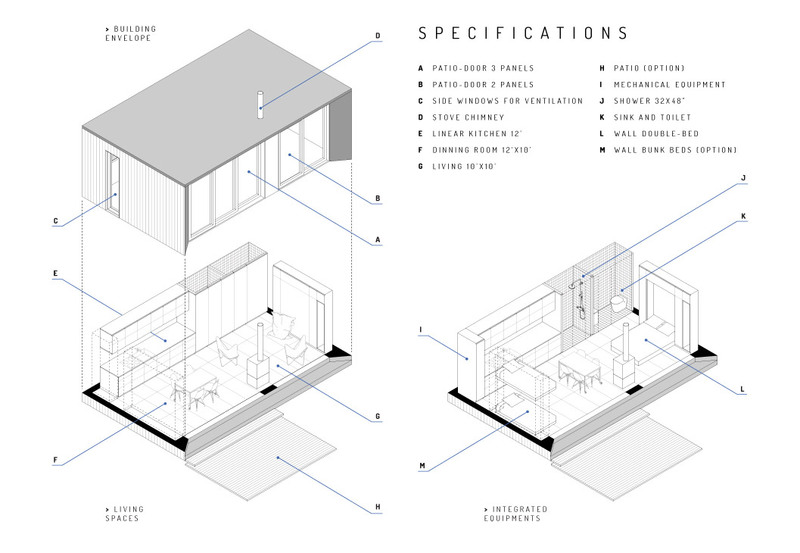 The length of the shelter can be modified to allow the integration of an additional room. The shelter has been designed to comfortably accommodate two people. Optionally, retractable beds can be integrated into the entrance wall to accommodate two additional occupants. In winter, the shelter’s large bay windows contribute to the passive heating. In summer, window’s openings provide excellent natural ventilation. The home incorporates a majority of local, sustainable, recyclable and renewable materials. Inside, VOC emissions are limited by the specification of water-based finishes and natural oils. When located on a site without services, the shelter can be provided optionally with a group of equipments ensuring energetic needs. PARA-SOL provides architectural services through PARA-SOL Inc.